Bart has teamed up with North Light books on several artist's photo reference and step-by-step painting books. Each of his artist's photo reference books include several step-by-step paintings based on photos in the book. 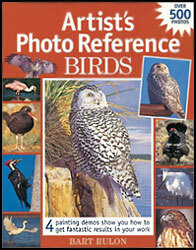 The books also include contributions by other well-known wildlife artists. Bart personalizes each book that is purchased through his web site. Please allow 1-3 weeks for delivery of books. Bart's new photo reference book, "Songbirds and More", is now available. The main focus of this book is songbirds, but it also includes other species of birds as well. Order your copy today. The price of the books include the cost of shipping. This book is for every artist who has ever wasted hours searching through field guides and magazines for photographs of birds to work from ... only to find photos out of focus, poorly lit or lacking details. Wildlife artist Bart Rulon - also an experienced wildlife photographer - understands the value of a good photo. His extensive travels have yielded an inspirational library of reference material, which he now shares with you. In this book, you'll find more than 500 photos of 43 bird species, all taken with the special needs of the artist in mind. Each bird is shown in a large primary photo, with additional photos showing a variety of angles and poses; close-ups of feathers, feet, and other details; and the bird in its natural habitat, perhaps in flight or at nest. You'll also find key information on habitat, feeding, physical characteristics and other helpful facts to help you create accurate works of art. Four step-by-step demonstrations in a variety of mediums show you how to use reference photos to paint beautiful birds. The sound of three killer whales surfacing within twenty feet startled Dave Sellers, Kalon Baughan and me as we paddled along in our kayaks. We were in awe of being able to paddle alongside some of the most beautiful animals in the world. Travelling in the wild photographing, sketching and painting wildlife subjects is, for me, the most enjoyable part of being an artist, and having friends to travel with that have the same enthusiasm about fieldwork makes it even better. The photographs and sketches representing my experiences in these trips have always served as inspiration for my paintings. With the improvement of my photography skills and multitude of adventures under my belt, I noticed my work steadily improving. Having a library of my own references of wildlife photographs made all the difference. Although my photographs are often less than perfect, they give me a vital starting point to make a painting that sums up an experience. Even if I stopped taking photographs today, I would never be able to use all the reference photographs I already have for my paintings. That is part of what sparked the idea for this book, which is intended to provide bird references from an artist's point of view. With all the species you'll find in the following pages, I have attempted to show the birds in a variety of situations, using different angles and poses, close-up photos for minute details and shots at a distance to show the bird together with its habitat. Unless otherwise noted, all my photographs are taken of wild birds, in the wild. This variety of photos should serve as a good form of reference for both bird painters and carvers, who often need more information to work from than they can find in their own files. And the four step-by-step demonstrations scattered throughout the book show you how to use reference photos to create beautiful bird paintings in various media.